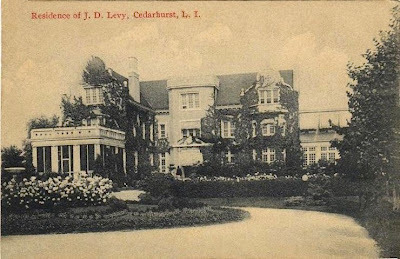 'Roselle Manor', the Isaac D. Levy estate designed by Buchman & Fox c. 1900 in Cedarhurst. Levy was president of Oppenheim-Collins Realty Co. and Oppenheim, Collins & Co., purveyor of women's clothing. 'Roselle Manor' was demolished c. 1960. Judging by what can be seen here I suspect the grounds around 'Roselle Manor' did not lean towards open expanses -- but to each their own. But I still think the ivy on the house should have been kept under a little better control. As for the house -- the center projection around & over the front door is kind of heavy compared to everything else; but I bet the wing off to the right, with the very large windows was a nice place to spend some time. "Dry goods store" sound ancient, when, in fact, Oppenheim Collins was a fairly fancy women's clothing store -- I'd rate it a step above Macy's, and a step below Sak's. There was a store in Hicksville, at Mid-Island Plaza -- I'd say it survived into the mid 1960s at least. Coats, dresses, hats, shoes, etc. I remember my mother getting clothes there -- in particular a spring coat, when women still bought light wool spring coats, primarily to wear to church.